Mako Sharks can live in cold or warm water, as well as deep or shallow water. They can swim up to 60 miles per hour but they generally swim are 30 to 35 miles per hour. The mako shark can be as long as 12 feet but are usually closer to 10 feet in length. Origin: North Sea and the Sea of ? ?Japan, in the coastal areas of Africa, Argentina and New Zealand. 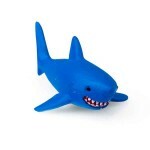 Print the Mako Shark Character Card! The Mako Shark is the fastest swimmer of all species of sharks in the world. They can swim at a top speed of 60 miles per hour when they are migrating or hunting for food. Mako shark is one of the most dangerous marine predators for humans. Mako Sharks teeth are extremely sharp, so that the predator can tear its prey just in seconds. Twenty six teeth are located on both upper and lower jaws.